In his new book, Marx, Capital, and the Madness of Economic Reason, Harvey provides a concise introduction to Marx’s theoretical framework and a compelling argument for its increasing relevance to the “insane and deeply troubling world in which we live.” Fleshing out a number of ideas first presented as part of a lecture series at the City University of New York, where he is Distinguished Professor of Anthropology and Geography, the book is characteristic of the “late Harvey”: incisive in its analysis, sweeping in its scope, accessible in its style and laced with profound insights on the madness of the economic system under which we live. The key contribution of The Madness of Economic Reason revolves around an attempt to visualize this dynamic logic of capital by means of an analogy from the natural sciences: the hydrological cycle. Like water, Harvey observes, capital constantly moves around. Moreover, as it circulates, it continuously changes form — without ever losing its essence. At the starting point of the circulation process, capital appears as money. It then reappears the next moment as means of production and labor power, which are in turn mobilized to produce a commodity for sale on the market, after which capital returns to its original form as money. This money is subsequently redistributed to different claimants (as wages, taxes, profit, rent and interest), only to be thrown back into circulation through consumption, state spending and productive investment. For Harvey, as for Marx, the first and second volumes speak to a “contradictory unity” between the valorization of capital in the production process and its realization in market exchange. The contradictions between these two moments can only be bridged by the circulation of interest-bearing capital, which — through the lubrication of production and the debt-financing of state spending and consumption — serves to harmonize both. Harvey’s dialectical reading of this totality thus allows him to integrate Marx’s sophisticated account of turnover times (dealt with in Volume II) and the credit system (Volume III) into his general analysis of the capitalist mode of production. This is particularly important because the systemic pressures to shorten turnover times and redeem mounting debts serve to shape the restless and crisis-prone nature of capitalism as a social order, contributing to a “penchant for speed-up [that] spills over from the realms of production and marketing to fundamentally transform the rhythms of daily life.” The same mode of analysis also allows Harvey to integrate the category of rent and account for capitalism’s inherent tendency towards expansion, which further contributes to the system’s unceasing transformation of its own spatial organization. What emerges, in short, is a visualization of capital that is much more attuned to its tumultuous spatio-temporal dynamics. These dynamics in turn have important implications for social struggles against the power of capital. Seen from the perspective of the totality, these struggles do not only take place within the realm of production, pitching workers against factory owners, but also extend into the spheres of realization, distribution, social reproduction and the relation to nature, where they take the form of debtors’ revolts against austerity, anti-gentrification struggles for affordable housing, student protests against the commodification of higher education, women’s struggles for the recognition of reproductive labor, indigenous mobilizations against the enclosure of common lands and resources, the global movement for climate justice, and so on. Crucially, as economic activity in the advanced capitalist countries has increasingly shifted towards the FIRE sector (finance, insurance and real estate), struggles in the latter domain — against the dispossessions wrought by bankers, landlords and bondholders — become increasingly central to daily life. The simple analogy of the hydrological cycle therefore enables Harvey to construct a panoramic overview not only of the inner motions of capital but also of the particular locations at which opposition is likely to emerge. The driving force in the hydrological cycle is incoming energy from the sun and that is fairly constant …. In the case of capital, the sources of energy … are more varied and the volume of capital in motion is constantly expanding at a compound rate because of a growth requirement. The hydrological cycle is closer to a genuine cycle (though there are signs of speed-up due to global warming), whereas the circulation of capital is, for reasons we will soon explain, a spiral in constant expansion. Driven by the enforcement mechanism of market competition, which compels each and every capitalist to seek to maximize profits, capital becomes an engine not only of perpetual motion but of perpetual expansion. If productive capitalists fail to extract sufficient surplus value, or if they fail to realize this value in exchange, they risk being eliminated from the market. The laws of competition therefore compel the capitalist to constantly throw part of his retained profits back into circulation and to constantly attempt to improve the productivity of the labor process in order to extract further surplus value. The logic of capital, in short, presupposes uninterrupted accumulation. Nowhere is this madness of economic reason more clearly on display than in China. Between 2011 and 2013, the country poured over 6,500 million tons of cement into its cities and countryside — an astonishing “45 percent more than the United States had consumed in the whole of the preceding century” (emphasis added). This historically unprecedented construction boom, which has utterly transformed China’s urban environment and left the country dotted with uninhabited ghost cities, was largely financed through a dramatic expansion of credit in the wake of the global financial crisis, with the country’s debt roughly quadrupling between 2007 and 2015, reaching 250 percent of GDP by 2016. Some analysts are now starting to express concerns that China’s growth miracle might prove to be the mother of all bubbles. SOCIAL RELATIONS AS NATURAL LAWS? 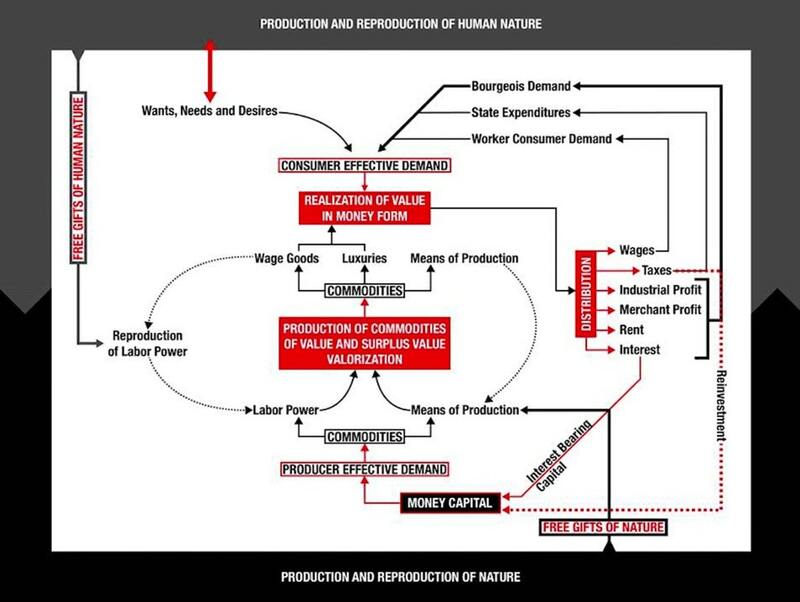 Harvey’s visualization of the process of capital circulation therefore provides a unique insight into the absurd irrationalities sustaining the capitalist order, especially in its highly financialized present form. If there is one unresolved tension in the book, however, it probably lies with Harvey’s recurring temptation — indeed, the systematic attempt — to explain capital’s inner laws of motion with reference to the natural laws of physics, chemistry and biology. The question that arises is to what extent Harvey’s repeated invocation of geo- and biophysical phenomena risks reifying capitalism’s historically situated social relations as immutable natural laws — especially to the minds of less initiated readers, who are likely to be attracted to the engaging and accessible nature of this introductory text. The principal contradiction here consists in the fact that Harvey, like Marx, defines capital as value in motion; yet value itself, he rightly insists, is fundamentally a social relation. It logically follows, then, that capital is a social relation in motion — a social relation, in other words, that continuously changes form as capital makes its way through the circulation process. At no point, however, do the shape-shifting social relations that constitute capital as value in motion cease to be social relations. Throughout the circulation process, capital merely appears as various “objects” (labor power, money, commodity, etc.) to be owned or bought and sold on the market. But this appearance, so brilliantly demystified by Marx in his analysis of commodity fetishism, merely obscures its true nature as a social relation. In sum, while geo- and biophysical analogies may help elucidate the important aspect of capital’s movements and metamorphoses as value in motion, they clearly fail to capture the equally important aspect of value as a historically specific social relation. Harvey, of course, is by no means oblivious to this; indeed, the critique of capitalist social relations is central to his entire intellectual project. 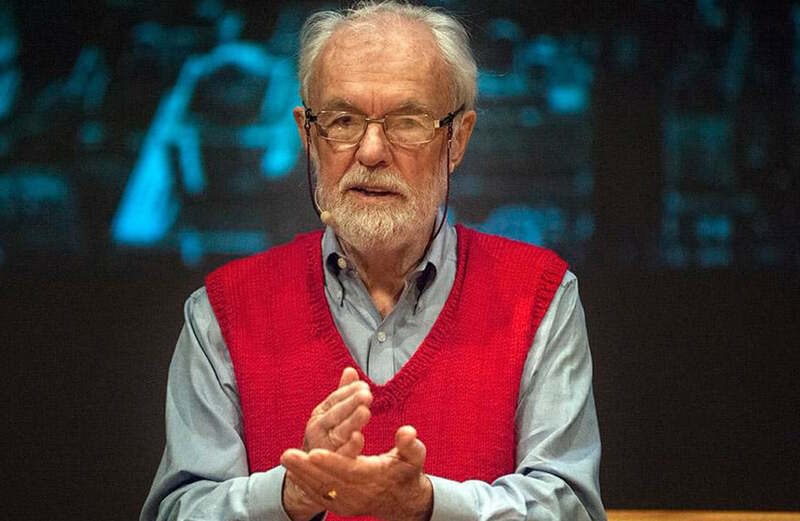 Probably more than any other living theorist, he is acutely aware of the mystifications inherent in the movements and metamorphoses of capital. To be fair, Harvey also repeatedly stresses the inevitable simplifications involved in his analogy of the water cycle. Yet he never explicitly acknowledges what is lost in this analogy. Indeed, the only difference Harvey identifies between the motion of water and the motion of capital has to do with the cyclical nature of the former and the “bad infinity” (or spiral-form) of the latter. The fact that the former operates on the basis of immutable natural laws, while the latter is the product of a long history of class struggle, unfortunately goes unmentioned. When the economists say that present-day relations — the relations of bourgeois production — are natural, they imply that these are the relations in which wealth is created and productive forces developed in conformity with the laws of nature. These relations therefore are themselves natural laws independent of the influence of time. They are eternal laws which must always govern society. Thus, there has been history, but there is no longer any. 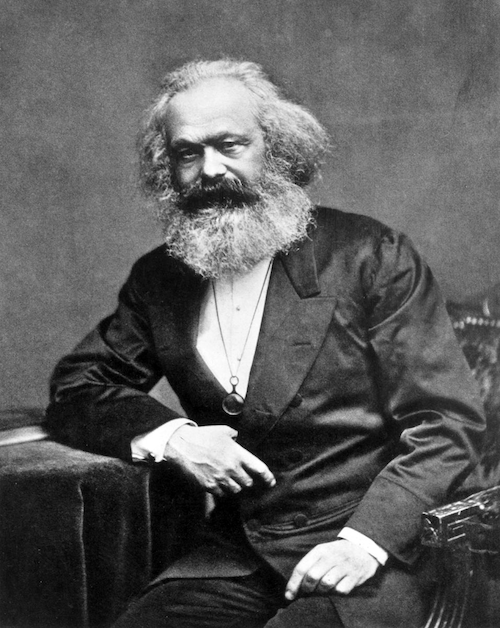 Marx’s outright rejection of the ahistorical nature of bourgeois theorizing was to become the foundation of his critique of political economy, including his detailed analysis of its principal categories in Capital and Theories of Surplus Value. If there is any good news that emerges from his analysis, then, it is that the social relations underpinning the circulation of capital can in principle be reshaped in a more rational and more just direction through an organized process of social and political struggle. 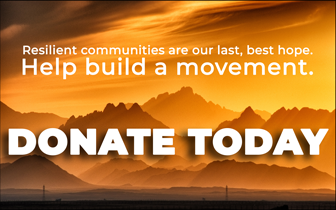 The challenge, in this light, would be to develop a compelling vision of the type of organizational forms and political strategies that could be developed in pursuit of such a revolutionary objective. Harvey made an initial stab at this challenge in previous works, including Rebel Cities and Seventeen Contradictions and the End of Capitalism, but one can only hope that he will keep returning to it in the future, if only to bring his exciting and highly illuminating reading of Marx to its logical conclusion: the question of what is to be done. In these tumultuous times, after all, the left urgently needs its brightest and most creative minds to focus on the intractable puzzle that now confronts it: the question of how to break up the vicious cycle of endless compound growth and bring an end to the institutionalized madness of economic reason before it lays waste to all human civilization. 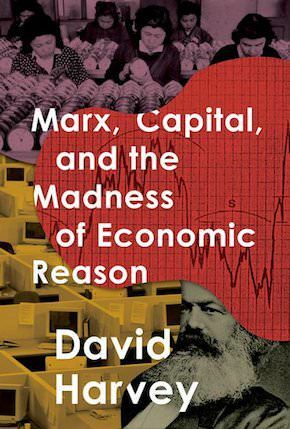 Marx, Capital, and the Madness of Economic Reason is published by Oxford University Press in the US and by Profile Books in the UK. Jerome Roos is a PhD researcher in International Political Economy at the European University Institute, and founding editor of ROAR Magazine. This article was written as part of his regular column for TeleSUR English.